Go to the library and discover books together. Take books with you as you travel. Carve out time each day – just 20 minutes – to read with your children. Describe your activities and what you are doing to infants and toddlers. Name objects and people and actions. Talk about what you see as you travel. Sing and play with words. Make up silly songs and poems to simple tunes. Change up the words in familiar songs. Play “I Spy”. Hunt for colors and numbers and letters with your preschooler. A bus ride, a trip to the grocery store or bank, a walk around the block, and even folding laundry are all opportunities to engage with your child. Learning moments happen anywhere, anytime. You are the original “App”. Talking, reading, singing, and listening are the best investments you can make for your children. Turn off all those devices – the TV, phone, and computer – and enjoy some time face-to-face with your child. Engaging with you is essential to your child’s learning. They crave interaction with you. Consider this your permission to unplug! Dialogic Reading - An effective way to read aloud with young children. Word of the Day: Ringing in the New Year! - Word of the Day helps children learn new wods throughout the year. Explore words to ring in the New Year! Share these words of thanks and love with a child in your life. Grade Level Reading Campaign Holiday Book List 2018 - Books make great gifts that give all year. Consider one of these! Word of the Day: Giving Thanks and Sharing Love - Explore words from Thanksgiving to New Year's Day. Use summer fun to build background knowledge - When kids have interesting experiences to draw on (background knowledge), they have a better chance of making a connection with what they read. Does reading aloud really matter? - Learn why it is so important to read aloud to your baby. Understanding the Difference Between a 'Late' reader and a Child with a Learning Issue - This article explains the early signs that parents can look for to determine the difference. Sharing Wordless Picture Books - This article gives great tips on how to read picture books with very few to no words. The great news is there is no right or wrong way! Read on to learn more! How to Read an E-Book with Your Child - This article offers practical tips for sharing e-books with your child, and how to keep the focus on reading and the story. Read With Me Gift Certificates - Give the gift of time with Read with Me gift certificates. Simply print off this sheet and share the gift of reading with friends, family and loved ones. Kindergarten, Here I Come! - Dear Families: Wow, time flies! The years before kindergarten are full of new learning and development. Enjoy this time together. Here’s what teachers love to see in Kindergarten. On the back are some fun ways to help your child build these skills. We can’t wait to meet your child! This information has been translated into several languages. 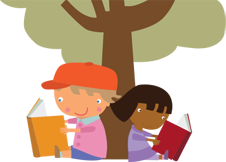 International Children's Library - This is an excellent FREE online resource that has over 4000 books, for ages 3-13, in 20 international languages.The ICDL Foundation promotes tolerance and respect for diverse cultures by providing access to the best of children's literature from around the world. Click here to search by language. Let's Talk about Grandparents! - As a grandparent, you play a truly special role in the lives of your grandchildren and family members. When you share rich conversations and stories with your grandchildren, you are helping to support their early brain and language development. Here are some fun ideas for ways you can bond with your grandchildren—simply by talking, reading, and singing together (in person or over the phone). Worcester Public Library Children's Events - Use this link to go directly to Worcester Public Library's Children's Program page.